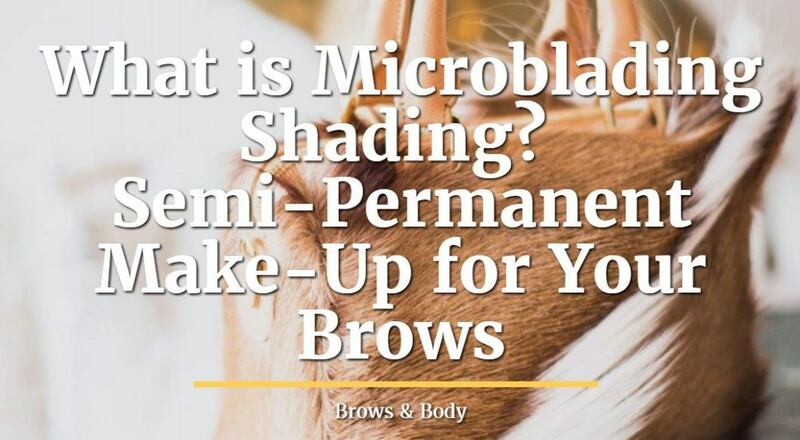 Have you heard about microblading shading? This post will teach you everything you need to know about microblading shading including which people should consider getting it, the pros and cons of this procedure and who shouldn't get it done. Microblading shading is a similar but separate technique when compared to microblading. Microblading is the art of placing strokes into the eyebrow area in an attempt to make the brows look more "real". Microblading shading is a complementary procedure that is often done in combination with microblading, but it results in a completely different look. Microblading shading is a "stipling" technique where the microblade is pushed directly down against the skin (as opposed to pulling or dragging the microblade across your skin). The result is a beautiful stipling of the eyebrow which creates a powder-filled result. Eyebrows that have been shaded often look like you have your make-up on 24/7. This can be great for someone people, but not for others! Because of how shading makes your brows look you should seriously consider the pros and cons of this procedure before you get it done. Not all microbladers offer this procedure. Microblading shading is what I consider to be a more advanced technique when compared to microblading. Most of the time artists who know how to use the shading technique have taken extra courses or have taken advanced classes to get this training. So if you know that you want shading (because you've seen the before and after pictures) then you may want to look for an artist who can do both! Microblading shading often costs a little bit more as well. On average it adds an extra 30 minutes to your microblading procedure and usually increases the total cost of the microblading procedure. Artists may charge an extra $50 to $200 for shading. This has to do with the increased skill required to complete the shading, the increase in time required and the increase in pigment, etc. One thing to note about microblading shading is that it can be quite painful when compared to regular microblading. For this reason (and we will discuss this below) you may want to think twice about this if your microblader does not use anesthetic cream or if you are notoriously difficult to "numb". Why should you get your brows shaded? So should everyone who is getting microbladed get shading done? There are several reasons you would want to and several you would not want to. Understanding these conditions and reasons will help you make the best possible choice for you. The end goal of getting your brows microbladed is to make your brows look amazing and for you to love them. The last thing you want to do is do something your artist wants to do but something that you don't feel comfortable doing. If you are considering getting your brows shaded then read these pros and cons. #1. It looks like you have make-up on 24/7. The first reason to get microblading shading is because you absolutely love the look of your eyebrows with make up on them. You have to realize that the shading technique will make your brows look "done up" 24/7. That means if you don't have make-up on, if you go to the gym, if you hit the grocery store late at night or whatever - it will look like your brows are done. This can be a double edged sword! Another benefit to shading is that your brows often look more authentic or more real. Even though the technique of microblading can provide very real results it doesn't exactly emulate what normal brows look like. Adding the shading component can bring depth and complexity to your brows and really make them look more "real". #2. You want to save time. Another important benefit that shouldn't be glossed over is time! Getting your brows microbladed and shaded will most likely cut a serious amount of time off of your morning routine. It may surprise you (or not) that some women spend up to an hour each morning on their brows! Imagine if you could cut this down to 5 minutes or 10 minutes? If you pick the right artist you can basically get your perfect brows drawn on your face in a semi-permanent way which will allow you to look great without all the hard work. #3. You very few natural eyebrows. Another HUGE reason to get shading is if you don't have very many natural eyebrow hairs. Some women (and men) because of medical conditions, chemotherapy or because they've been aggressive in their tweezing - have VERY few brows. While microblading is a great first step for these people, it really won't provide them with the exact perfect look. The blades from the microblading procedure look great, but in order to bring depth and dimensions to your brows the shading may be required. People who have no eyebrows often find themselves placing SOME make-up on their face in the morning to compliment their brows. With shading you can cut out this entirely (or significantly reduce it) and should seriously be considered if you have little to no eyebrow hair to begin with. Why shouldn't you get your brows shaded? #1. You don't want your brows to look like you have make-up on all the time. I previously said that looking "done-up" is a double edged sword and that is true for many people. It can be both a blessing and a curse to look done! Believe it or not many women don't like looking like they have make-up on 24/7 and this may be one reason not to get your brows shaded. The problem here is that sometimes your brows can stand out or look out of place, especially if you don't want the extra attention. It's not a big deal, but it's certainly worth considering. #2. You aren't 100% sure about the microblading procedure. You should NOT get your brows shaded if you aren't 100% sure you even want to get your brows microbladed! You can think of shading as taking the microblading one step further and adding even MORE to the existing procedure. This is great if you already know and love your microbladed brows, but you have to realize that many women aren't 100% sure they even want their brows bladed to begin with. If you fall into this camp then you should NOT get your brows shaded on your initial visit. You can always add the shading to your touch-up after you have time to let your brows marinate and grow on you. In some cases the changes to your brows may be shocking, especially if you add shading to the blading. #3. You are sensitive to pain! The last point isn't the most important but it is definitely worth considering and that is the pain component. Microblading isn't necessarily a gentle procedure, but adding the stipling and shading to the procedure definitely doesn't make it any less painful. In fact some people find it to be seriously painful. Now this isn't usually an issue as long as you have an artist that uses the right type of numbing cream (or anesthetic cream), but it's definitely worth considering. There are some people out there who simply don't get numb, no matter how much anesthetic is used. Imagine poking your skin with needles for 20-30 minutes straight with the intent to make you bleed. Doesn't sound very good, right? Microblading shading is definitely something that can add great complexity to your existing brows and even make them look more real like. Having said that you should make sure that you fit the criteria for those who stand to benefit from this procedure. Like anything make sure you research, research, research and find the best artist for you before you get microbladed or shaded! Have you had shading done?